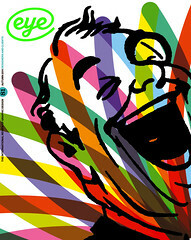 Eye Magazine | Review | Beyond the gimmick age? SVK is the first comic published by London design studio BERG (best known for their computer-based inventions) and, as might be expected, it oozes design innovation and professionalism. Readers use a credit card- sized black-light torch (included) to scan each page, revealing extra layers of words and images printed in ultraviolet ink. It’s an appealing idea, and SVK’s first print run of 3500 copies sold out in two days (a second edition came out in September). This ‘graphic novella’ also contains an introduction by novelist William Gibson and articles by global thinker Jamais Cascio and comics historian Paul Gravett on augmented reality and comics’ interactivity (respectively); giving readers some clues about SVK’s subject matter and narrative enhancements. Industry wisdom states comics should be wary of gimmicks, after the 1980s and 1990s saw corporations artificially inflate and then nearly collapse their own market with collectors’ editions, multiple covers, alternate endings and so forth. But as a serious attempt to add another dimension to the comics page, SVK goes well beyond such trivialities. Reading it for the first time is an exciting experience that stretches the potential of comics; edging them closer to multimedia status. Calling it ‘the biggest technical challenge I’ve faced in the last ten years’, artist Matt ‘D’Israeli’ Brooker creates invisible ‘Easter eggs’ on the page, moving his role closer to that of the programmer or interface designer, as SVK ‘takes the tropes of augmented reality ... and does them in ink’ (Jack Schulze, BERG). SVK is visually striking and its art complements the subtleties of the story perfectly. D’Israeli’s colour palette is reminiscent of Chris Ware and Daniel Clowes’ work: muted blue tones recall the glare of a television screen and imply a consumed and consuming society. Reading on, this seems well suited to the book’s storyline. Though it is difficult to say much about the plot without spoilers, SVK’s detective theme and bleak setting reminded me in some ways of Ellis’s ongoing series, Fell (Image Comics, 2005-), although augmented reality takes this story to a new level. Although the ultraviolet elements could add more to the story, the device allows readers to enter the comic’s plot and page in a way not usually possible and the tale saves a few surprises for its end. There are some criticisms: some faulty torches were included in the first edition (now dealt with by BERG) and, despite very high production values and good-quality paper, the ultraviolet ink can sometimes be seen through a page – although I found this improved slightly when reading under electric light rather than in daylight. Clicking the torch on and off disrupts the reading experience sometimes, but experimenting with different ways of revealing the page was interesting. Ellis’s fans won’t be disappointed by the writing, and D’Israeli’s art conjures the mood perfectly. If you have ever wanted to use augmented reality in everyday life – to literally walk down an information superhighway – SVK is well worth a look.